Are you an active duty service member ready to get your master's? 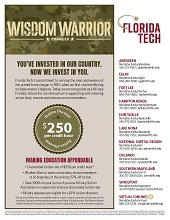 Let Florida Tech invest in your education through our Wisdom Warrior Program! Save over 57% on your graduate degree tuition and up to 100% if you use your Military Tuition Assistance. Additional assistance available for military spouses. Explore the Florida Tech locations near you or learn more about our 100% online degrees. To receive this brochure with all the facts you’ll need, fill out the form. *Capped tuition rate available only for Extended Studies off-site location master’s degree students; excludes doctoral programs and Florida Tech University Online programs. Learn more about some of the master's programs available on-site or online. Packed with information you can use to make one of the most important decisions of your life!